The Adam's smart looks and the almost infinite possibilities for personalisation make it a genuine alternative to the likes of the Mini and Fiat 500. Just don't go expecting the Mini's brilliant driving experience. 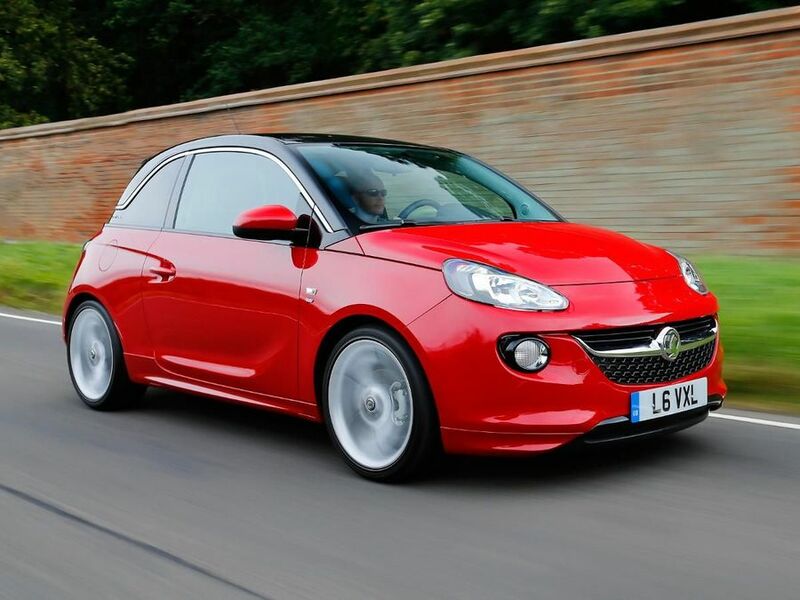 Interested in buying a Vauxhall ADAM? Unlike the Mini and Fiat 500, the Adam does not look to the past for its inspiration. Instead, the design is consciously modern, with lots of neat little touches, such as the ‘floating’ roof and the Adam badge set onto the side of the car. However, the key to the Adam’s appeal is how much you can adapt that basic shape: the scope for personalisation is huge, with a massive range of body colours, roof colours and alloy wheel designs. Some of the combinations work better than others and some of the names are rather less sensible than others – James Blonde and Buzz Light Green? – but with more than a million possible combinations to choose from, there’s a chance that every Adam will be unique. The Adam has a suitably smart cabin – although it certainly won’t be to all tastes – and the dash has some neat features, such as the ‘wing’ design, the silver surrounds on the dials and air vents, and the red details on the speedo and rev-counter needles. What’s more, the quality certainly is a step up from the Fiat 500. However, like the exterior, the cabin is little more than a blank canvas on which to paint your own personality. You can choose from a range of colours, seat designs, ambient lighting colours and interior decors: among the more bizarre options are a cloud-covered roof lining and a set of 60 LEDs to shine in the roof like stars in the sky. What’s more, much of this can be changed, so if you decide you want a different set of inlays at some stage in the future, that’s perfectly possible. We have no issues with the driving position, but the limited over-the-shoulder view (due to the thick rear pillars) is a real problem. In the front seats, there’s plenty of head- and legroom, with a good range of adjustment on the seat and wheel. And, if you choose the Intellilink system (which allows you plug in a smartphone and operate it through a dash-mounted touch-screen), the ergonomics are mostly fine. However, some of the more minor switchgear is awkward to reach. Worse still is the rear-seat accommodation: with a couple of tall adults in the front, there’s next to no legroom in the back. The headroom is also very tight – anyone over five-and-a-half feet tall will struggle to sit upright – meaning that the Adam is effectively a two-plus-two, not a full four-seater. Finally, although the boot capacity looks decent enough on paper – it’s bigger than the Mini’s and Fiat 500’s – the high sill and narrow opening make it awkward to load and unload luggage. Sad to say, the Adam is a real disappointment on the road. The steering has no feel around the straight-ahead position and virtually no weight as you turn in, so you have little idea of what the front wheels are up to. The ride is disappointing, too, feeling too firm at all speeds, and especially so on models with larger wheels. That said, we have to temper our criticism, as we have only driven the car with 17- and 18-inch wheels and sports suspension. Lower down the range, the Adam has 16-inch wheels and standard suspension, which we suspect will be the better option. There’s no denying the car has plenty of grip and it handles very capably, but the Adam certainly lacks the appeal of the Mini, which is much more exciting to drive. The Adam has a choice of three petrol engines – the company says it has no plans for diesel units, as they would be prohibitively expensive – but we have only driven the mid-range 86bhp unit. It’s perfectly happy around town, more than capable of getting from one red light to the next at a decent pace, but once you get out of town, it shows its limitations. It has relatively little torque low down in the rev range, so you need to give it plenty of revs to keep up a good pace across country. In addition, you sometimes need to drop down a gear to keep up with the ebb and flow of traffic on the motorway, especially on hills. The refinement is good enough once you settle down at cruising speeds, but the engine is rather noisy when you rev it hard. Every model averages more than 50mpg, with the optional stop-start system improving the figures by between 3 and 4mpg. However, that’s quite disappointing when you can find versions of the Adam’s most major rivals that give much better fuel economy. Depreciation will be the biggest cost for any buyer to bear, but it’s not yet clear how well the Adam will retain its value. Much will depend on the individual car’s specification, so buyers are advised to avoid going too OTT with the options list and to steer clear of some of the more outlandish colour combinations. The Adam has engines and transmissions that are proven in other Vauxhalls, so we don’t expect any huge problems. According to figures from Warranty Direct, Vauxhall’s reliability is around average, as is that of other small Vauxhalls, such as the Corsa. We expect the Adam to follow suit. The Adam earned four stars in Euro NCAP crash tests – which is something of a disappointment by today’s standards – scoring well in the frontal impact, but providing weak protection of the chest in the side pole test. For all the opportunities to thoroughly personalise the Adam, one thing that every model shares is the list of safety features. Every version comes with six airbags as standard, as well as anti-lock brakes and stability control. On top of that, the car is also fitted with adaptive brake lights: if the driver brakes hard enough to activate the anti-lock brake system, the brake lights flash five times a second to warn drivers behind. The only option is a tyre-pressure monitoring system. In keeping with the car’s ethos, the Adam has a series of unconventionally named trim levels. Even the most basic (Jam) comes with alloy wheels, air-conditioning, digital radio, Bluetooth and daytime running lights. Step up a level (to Glam) and you upgrade to climate control and LED running lights, as well as adding a glass roof, cruise control, body-coloured door handles and chrome-effect window mouldings and sill covers. The range-topping Slam gets a load of extra styling features (different-colour roof and mirrors, tinted rear windows and larger alloys) and sports suspension. Mind you, the whole point with Adam is what you add beyond the standard equipment, every trim level offering a host of options and packs – most of which are pretty cheap – that let you tailor the car to your heart’s content. If you fancy something stylish and want modern rather than retro, the Adam will certainly appeal. It has such a huge range of personalisation options that you can pretty much guarantee that no two Adams will look the same. Do bear in mind, though, that rivals such as the Mini and Fiat 500 are better to drive and more practical.